My last book read for the annual RIP Challenge (so sorry to see it end!) 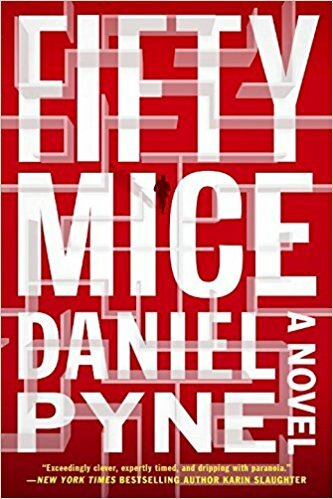 was a twisty thriller about Witness Protection called Fifty Mice by Daniel Pyne. Jay Johnson was getting on the subway on a perfectly ordinary day when he was suddenly grabbed, stabbed with a needle, and taken away. He wakes up in a hospital bed with his fingerprints burned off with acid and two people beside him who clearly have fake names (John Q. Public and Jane Doe) and tell him that he's "in the program" now. Confused and scared, he insists they've made a mistake and asks them what they think he saw or knows, but they refuse to tell him. They explain that that would mess up the case; he needs to remember on his own. Before long, he's been taken to Catalina Island, off the coast of his home in L.A., and set up with a fake life in a nice little home, with a fake job (in a video store! ), a fake name (that he refuses to use), and a fake wife and 8-year old daughter. They are named Ginger and Helen, respectively, and Jay (now Jimmy) assumes they are in Witness Protection, too. They begin to settle into this surreal world where nothing is real, while Jay attends daily "counseling" sessions to try to help him remember whatever it is that they think he forgot. Jay soon begins to figure out that almost everyone in Avalon Bay (the small town on Catalina's coast) is either a protected witness (some of them criminals) or a Fed watching over witnesses. All the Feds around Jay pretending to be jocular neighbors and friends are driving him a little crazy, as he slowly gets to know Ginger and Helen better. His previous job in a lab working with mice feels like a metaphor for his current situation, trapped in a maze, not knowing where the exit is. I really enjoyed this original and fast-paced thriller, with surprises around every corner. It's suspenseful and action-packed but also a psychological thriller, as Jay continues to wonder why they want him or if they have the wrong guy and whether this is all a case of mistaken identity. The author also plays around with the concept of memory, with a few excerpts from psychology texts regarding the malleability of memory introducing new sections. I loved the author's amusing vision of Catalina Island as this fake world where most of its residents are witnesses or Feds. Having visited Catalina before, I found this premise to be funny and clever, and the tension of the story is eased by its sense of humor. The story truly unfolds like a maze, with dead ends, phony paths, and confusing turns, as Jay struggles to figure out why he is there - and how to get out. You will wonder, along with Jay, what is real and what is not? Or you can order Fifty Mice from Book Depository, with free shipping worldwide. Catalina island is so near me and it is funny to picture Avalon as a witness protection program. I'll definitely put this on my TBR list! I know! I got a real kick out of that :) Vacationed there with my family when I was 20. It's really a hilarious premise.